Big Papa & The Sistas | Paul's Voyage of Discovery & Etc. One of the great joys of my life in the past couple years has been making great music with my three daughters as Big Papa & The Sistas. 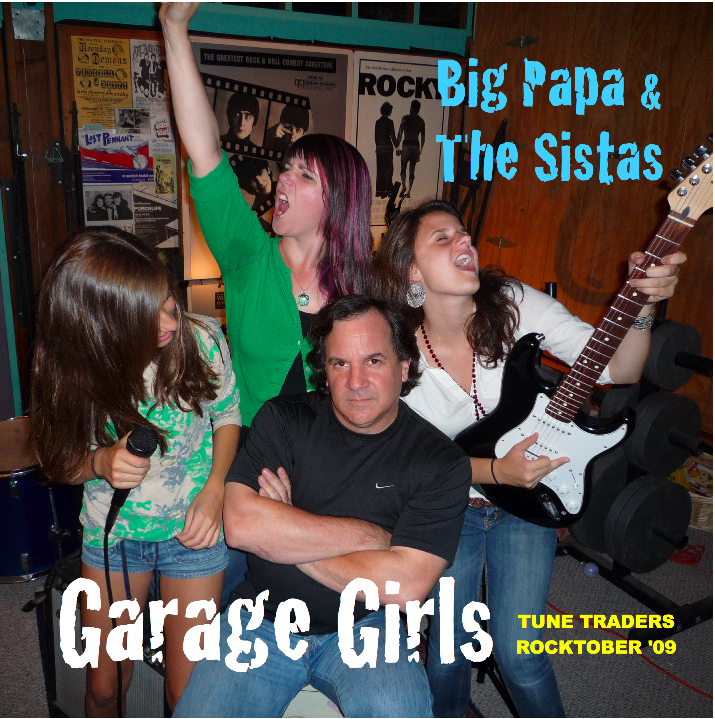 Our first CD, “Rocktober Girls”, was recorded in 2008 and sent to our friends and fellow music lovers in Tune Traders, a group of friends in a musical exchange group led by FM radio host and Madison, Wisconsin local legend, Casey “Casemo” Fox. 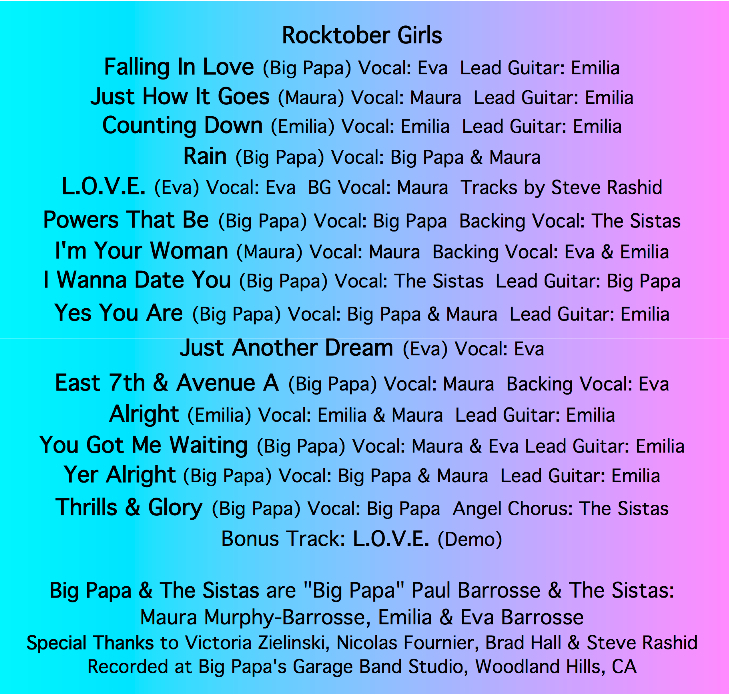 Here’s the lineup of songs on the “Rocktober Girls” CD. 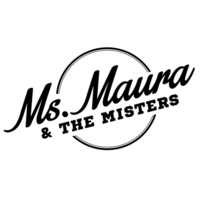 Check out my duet with Maura, “Rain — and Eva’s wonderful ballad, L.O.V.E..
We just finished our second CD, “Garage Girls” in October, 2009. Below is the CD cover, shot by my wife, Victoria, in our recently cleaned-up garage. Click on “Lazy Saturday” to download one of our songs, written by my daughter Maura, Lazy Saturday. You may also want to check out Emilia’s hard rocking style on I Never Been. The rest of the CD features a lot of fun songs, including Eva’s teenage love ballad, So Right and a song that Emilia and I wrote about our fabulous cat — and that Maura sang with so much soul — Savage Heart. Our third CD, “Sistas’ Songbook”, released in October, 2010, is a collection of songs with spare arrangements that put an emphasis on the song and the singer. After her two-week session at Interlochen’s first singer-songwriter camp, Little Sista Eva’s songwriting has blossomed and she carries the weight on “Sistas’ Songbook”. 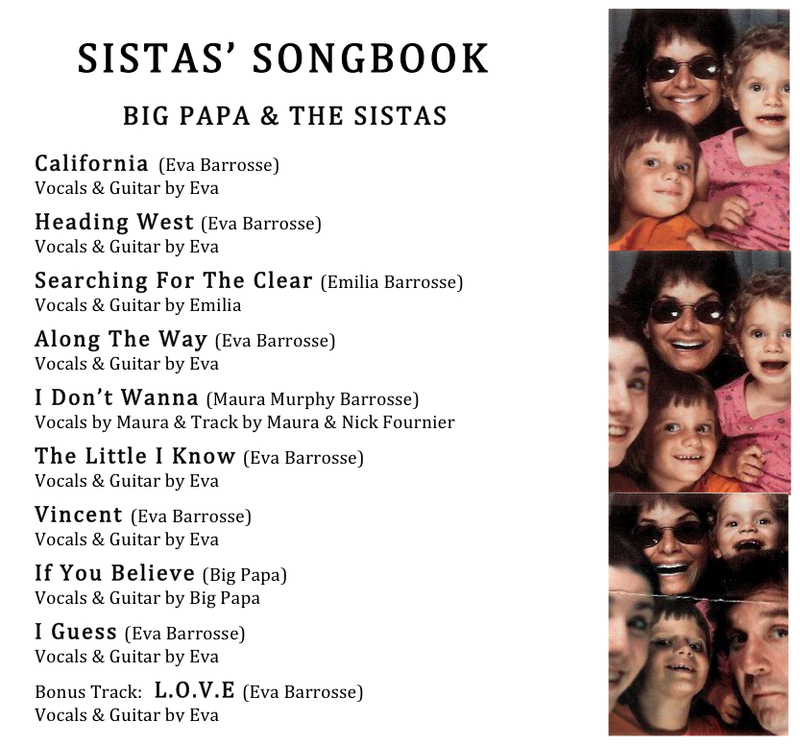 Among the tunes on “Sistas’ Songbook” are Eva’s haunting Heading West, Emilia’s rocking Searching For The Clear, Maura’s bluesy, defiant lament, I Don’t Wanna, and Big Papa’s old fashioned lefty folk song, If You Believe. 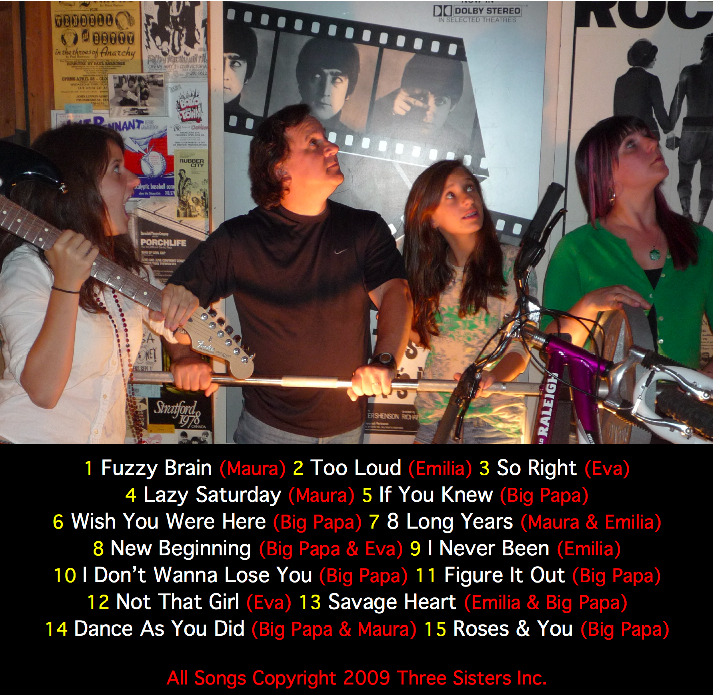 All songs on the Big Papa & The Sistas CDs are copyright 2008, 2009 and 2010 by Three Sisters Inc.
Love them girls and their Papa.